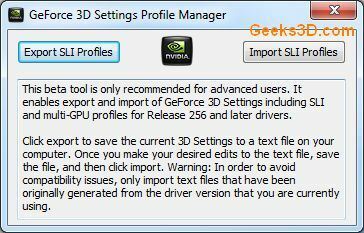 GeForce SLI Profile Tool is a simple utility, developed by NVIDIA, that enables SLI customers to export their SLI profiles to a text file, edit them, and then import them back into the driver. Yes. In Release 256 and later display drivers, NVIDIA has made some significant enhancements to the infrastructure of the 3D settings in the NVIDIA Control Panel. These infrastructure changes will make the 3D settings and profiles faster and more robust and provide 3rd party developers with full access and control through a new API. The new infrastructure no longer uses XML to store some of the settings like SLI profiles. Instead, all 3D settings and profiles are fully integrated into the new API with support for versioning, Unicode executable names, and improved access performance. This now includes not just control over DirectX settings, but also OpenGL and CUDA settings. 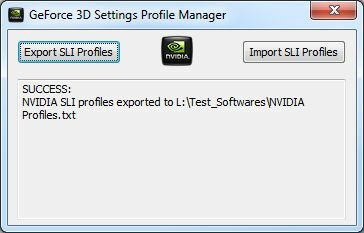 Instead of editing NvApps.xml, we have created a simple tool that enables SLI customers to export their SLI profiles to a text file, edit them, and then import them back into the driver. 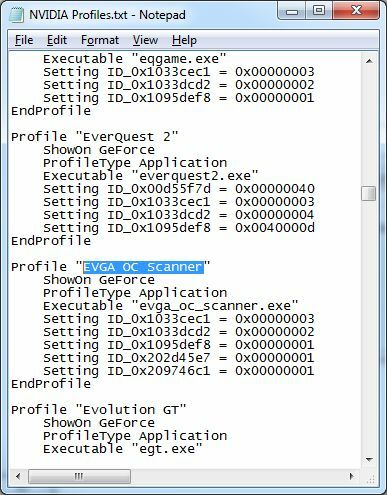 You can download the tool “Geforce_SLI_Profile_Tool.exe” from the File Attachments section below. There was a problem importing the settings from disk. Works fine with 275.33 drivers for ION for notebooks. Thanks a lot, it allowed me to play Aion on my netbook (which runs from a .bin file instead of an .exe). I added a bin executable to an exported Aion profile and bam – works fine now! Where is the file NVIDIA profile.txt ? 326.80 drivers and on – DOESN’T WORK anymore. Is it ever going to be updated? I can’t reconfigure my huge damned profile EVERY Windows reformat. Nor am I willing to stay on old drivers forever. ERROR: This driver is not supported by this tool. You need a driver from release 256 onwards. Hello friends, sorry but I’m in trouble and need help. There any way to activate the sli quadro fx 3800 cards in asus P8Z77-v, because I have researched and seen that the sli this board is not muti-gpu but the multi-. already appreciate. Thank you.